C-49 Bridge Overhang Brackets NOW available 1/6/19. 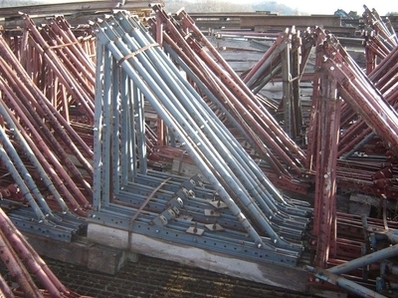 Reach our sales department for great prices on used C49 bridge brackets. Dayton C49 Bridge Overhang Brackets offers bridge contractors four different versions of the C-49 Bridge Overhang Bracket, which allows for maximum adjust-ability to meet the varied bridge overhang formwork requirements on both structural steel and precast/pre-stressed concrete beams. The C-49 Dayton Bridge Bracket is the most versatile overhang bracket available and is used for general conditions. The C-49-D Dayton Bridge Bracket version is used on deep beams. The C-49-D Dayton bracket is identical to the C-49 bracket, except it uses longer bottom diagonal and vertical legs. The C-49-S Dayton Bridge Bracket is a field modified C-49. The C-49 is modified by removing the inner vertical leg. Using only the outer vertical leg, the Dayton Bridge Bracket can be adjusted to a minimum vertical height of 14 inches. The Dayton Bridge Bracket is ideal for use on short steel or concrete beams. The C-49-JR is a small Dayton bracket used in situations where the horizontal member of the standard C-49 Overhang Bracket is too long, due to limited space between twin bridges. Each of these Dayton Bridge Brackets offer the bridge contractor, the ability to easily and quickly preset the brackets to size and shape on the ground, as required for each specific bridge overhang requirement. The adjusting nut and the wide range of adjust-ability built into the overhang brackets vertical and diagonal legs allow a bracket to be adjusted to fit almost any standard bridge overhang. Both the vertical and diagonal legs have adjustment holes spaced at 2 inch increments which allows the legs to be adjusted so the diagonal leg will transfer the construction load to near the bottom flange, which aids in resisting web deflection and bending.